The city of Faro has a long and colourful past. Now the capital of Portugal’s world-famous Algarve region, that stretches some 200km along the country’s southern coastline flanking the Atlantic Ocean, Faro gives the feeling of having one foot in the past and one in the present. 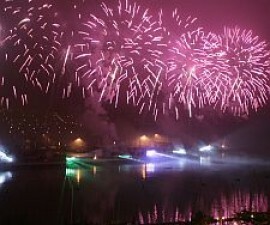 There has been a settlement on the site of the city of Faro since prehistoric times and the city came into its own during the Roman occupation when it was known as the city of Ossonoba. Thanks to its coastal position guarded by wetlands and golden sandspits it generated great riches from its fishing and salt industries during that era. Even at that time, it was considered the most important city in the area and its success continued throughout the time of the Moors until it was razed almost to the ground by the Earl of Essex during the Christian reconquest in 1596. Today, the city is a delightful mixture of Moorish remains and eighteenth-century Portuguese architecture, piled together in a series of cobbled streets and the remains of the old city walls. The historical old town is divided into two main areas: the Vila-Adentro, the oldest part; and the Mouraria, the area where the Moors settled from the late thirteenth century. The Vila-Adentro is contained almost entirely within the medieval city walls and accessed via three medieval gates, or arches. These are known as the Arco da Vila, Arco do Repouso and Arco da Porta Nova. 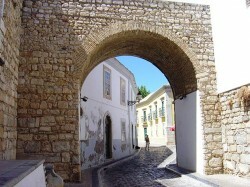 The Arco da Vila is commonly proclaimed to make the best starting point for your tour of the Old Town. 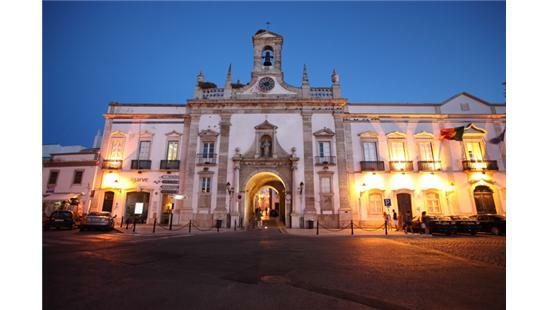 From here the town stretches out in front of you, through a maze of cobbled streets that converge and open out at the Largo da Sé, the orange tree-lined square that is home to the nineteenth-century Town Hall, the eighteenth-century Bishop’s Palace and the ancient cathedral. 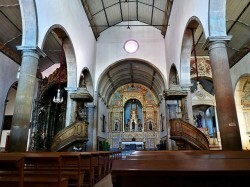 The area is a delightful hotchpotch of baroque, gothic and other architectural styles, dominated by the Sé or cathedral which was originally built after the area reverted to Christian rule on the site of a Roman forum turned mosque. 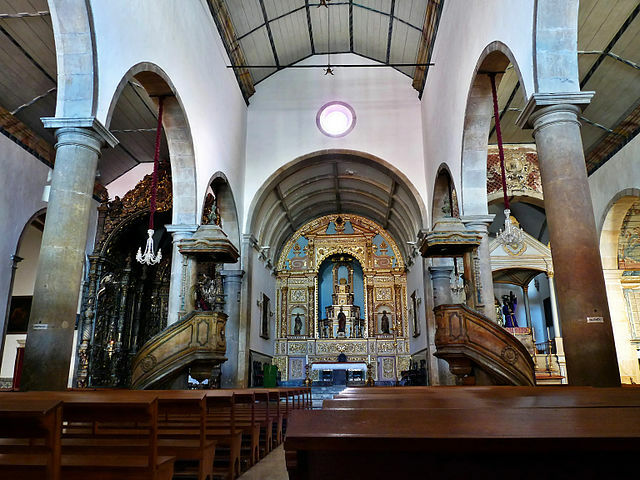 It has been damaged and reconstructed several times during its history due to a combination of natural disasters and planned strategic attacks, resulting in a beguiling mix of decorative and architectural styles. It is possible for visitors to ascend the cathedral tower, a climb that is well worth the effort. The tower’s summit offers breathtaking views over Portugal’s “southern capital” past the scissor roofs, across the wetlands of the Ria Formosa Natural Park, with its turquoise lagoon, golden sandbanks and varied bird and animal life, and out over the horizon across the mighty Atlantic Ocean beyond. Heading away from the square, the meandering cobbled streets lead you on to the Museum of the City Hall of Faro, one of the oldest and most important buildings in the town. 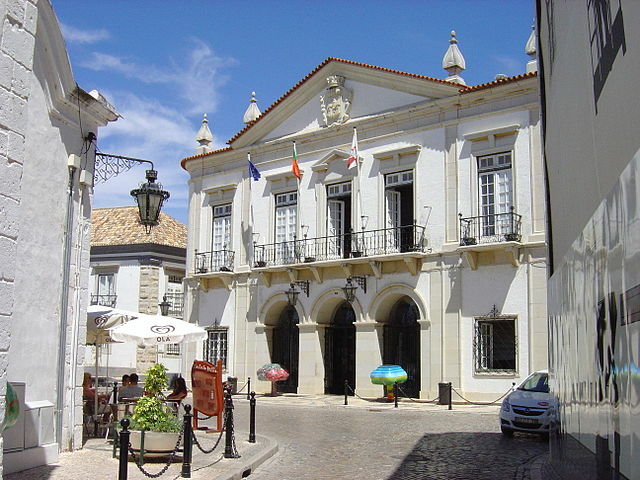 The Museum of the City Hall of Faro began life as an important ecclesiastical building, the Convento da Nossa Senhora da Assunção and now contains an interesting collection of ecclesiastical and archaeological artifacts and relics from the area. Take time out to wander through the now-pedestrianised streets of the Rua do Santo Antonio, stopping for a refreshing drink or delicious pastry at one of the open-air cafés and exploring the quirky shops and boutiques that are nestled in the historical buildings. The Rua do Lethes provides an interesting detour to the Teatro Lethes, the city’s theatre, which was designed to be a miniature version of Milan’s La Scala. The meandering streets of the Old Town are punctuated by fascinating artistic pieces documenting some of Faro’s important history. Ceramic tiles so typical of Portugal’s heritage are used to great effect to describe and depict some of the city’s most famous scenes and provide a fascinating insight into the history and culture of the city. The Arco da Porta Nova, also known as the Portas do Mar or “Doors of the Sea” provides the perfect exit point from the Old Town, marking the place where city and water meet and the departure point for excursions out to the Ria Formosa Natural Park. Take time to explore the outer side of the city walls, the Mouraria, where the moors settled after the Christian reconquest and which is now a busy shopping area and the perfect place for a relaxing stroll amongst the gift shops and boutiques that line the area.